Fun and abstract floral it what comes to my mind when I received this card as a swap. Karen Miller used the Swirly Bird Stamp Set to lay down the Daffodil Delight circles behind her swirly floral layers. She used the ink splatters (as I like to call them) from the Timeless Textures Stamp Set for some background dimension in Old Olive Ink. 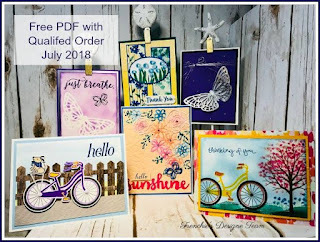 I'm not absolutely sure but I think the Swirly Florals were die cut from the Garden Impressions Designer Series Paper using the Swirly Scribbles Thinlets and the Leaf Punch was used with this paper as well. The butterfly too was die cut from this Designer Series Paper using the Sunshine Wishes Thinlits. Karen finished her creation off with a few Rhinestone Basic Jewels for that added bling. So now you can see why I said and More in the description of this card, Truly beautiful and orginal which is always a plus.